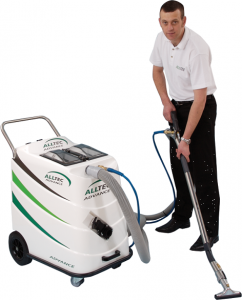 Steam Cleaning Carpet Machines are more commonly known as Hot Water Extraction Machines or simply HWE for short. The term ‘steam cleaning’ was simply a marketing approach for selling this type of method. Steam at 212º (boiling) is not used when cleaning the carpet so the term Hot Water Extraction is a more accurate description. Equipment, techniques and solutions are constantly improving but the basic system still remains the same. The hot water is sprayed into the carpet through a floor wand, with a solution such as Ultimate Master, and then extracted back to the machines waste tank through the wand removing the soil suspended in the hot water and solution. The results you will see from HWE can be greatly improved by applying a prespray, using agitation and allowing for dwell time before extraction cleaning. It is a very effective cleaning method and the most used method today. When carried out correctly it has been found by independent experts and laboratories to remove greater amounts of soil than other methods. It is a low cost method of cleaning. Although the initial cost of the equipment may be higher than the other methods the cleaning solutions used are very inexpensive in use. It some cases the drying time can be longer. Extraction cleaning drying times can range from 2 hours up to 24 hours in extreme cases. To help reduce the drying time ensure that your steam cleaning carpet machine has good vacuum efficiency to increase water lift and air flow. As mentioned the equipment can be more expensive but with professional training a well looked after steam carpet cleaning machine can last you years! Click here to browse our range of Hot Water Extraction Machines.